well rather, i guess the case is open. Alaa bought me an ipad 2 for my birthday and now i'm on the hunt for a cute and functional case. 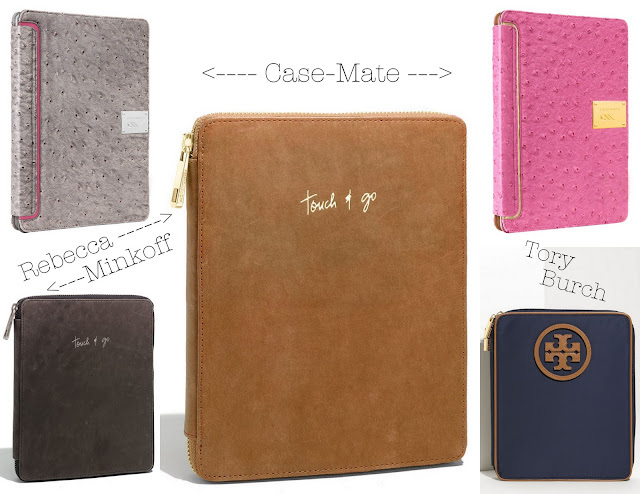 i really love the Tory Burch one ( it reminds me of blair from gossip girl) the case-mates are super cute and look really sturdy, but i want something gender friendly so alaa won't feel like it's too girly for him to use...which leaves me with the Rebecca Minkoff "tobacco" (in the middle). i love the color and the sweet note is so cute! OMG, these are all amazing. Makes me want an ipad, just for the case, lol. so hard to choose.. these are all great picks! the middle one is totally my fave too! I have to agree with Jessica, I like the Rebecca Minkoff, the Middle. it just seem like timeless to me. sweet elegant and gentle. Okay I don't know which I love more! The touch and go are too cool! The Rebeca Minkoff one was one of my faves. You can't go wrong with it!